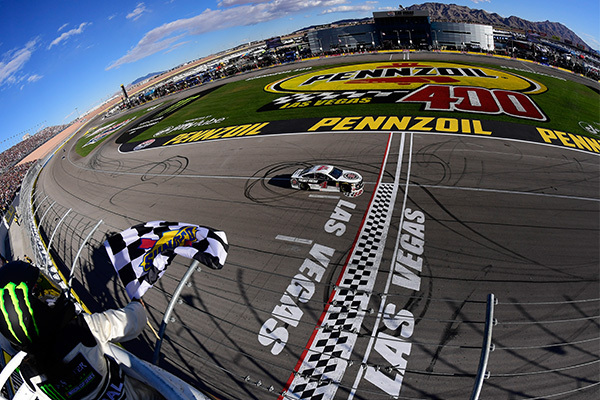 LAS VEGAS, NV, March 5, 2018 – Stewart-Haas Racing and Kevin Harvick double down to win their second Monster Energy NASCAR Cup Series race in a row, winning the Pennzoil 400 presented by Jiffy Lube at Las Vegas Motor Speedway. 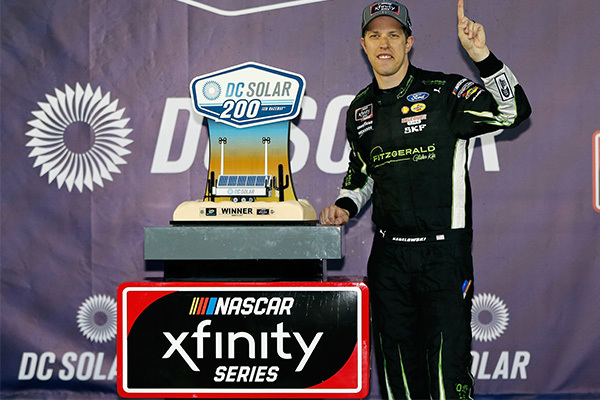 Recording his fourth MENCS race win with Ford Performance and fifth time winning back-to-back races in his career. From the second lap of the race the No. 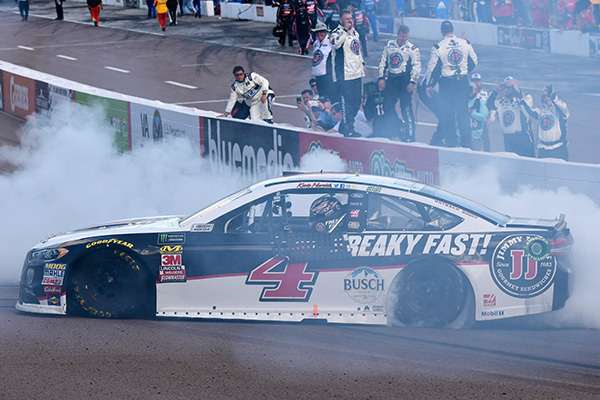 4 Harvick, with the Ford FR9 horsepower, took control to win both Stages. 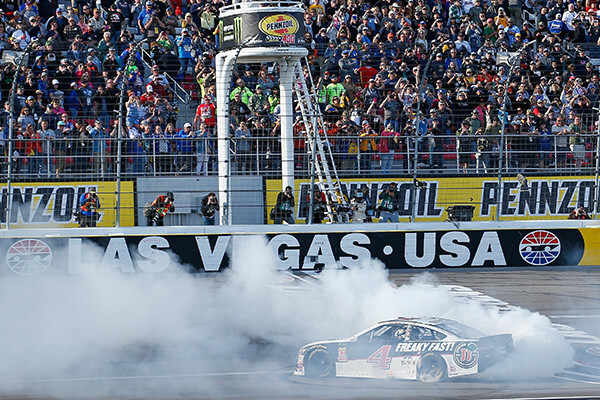 Harvick led the most laps by a winner at Las Vegas Motor Speedway with a total of 214 laps out of a 267 laps, on his way to recording his 13th win on a 1.5-mile track. 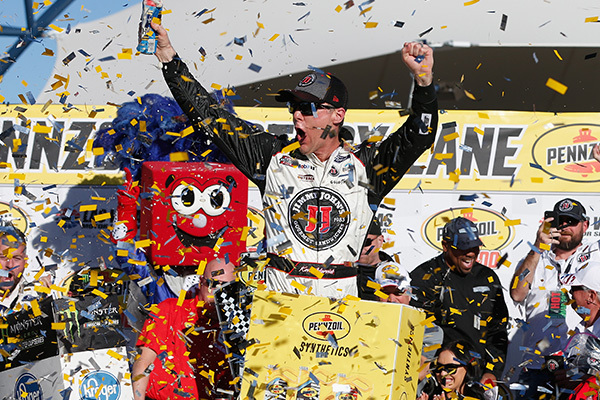 In achieving his 100th career win, Harvick has recorded 39 MENCS wins, 47 NASCAR Xfinity wins and 14 Camping World Truck Series wins. 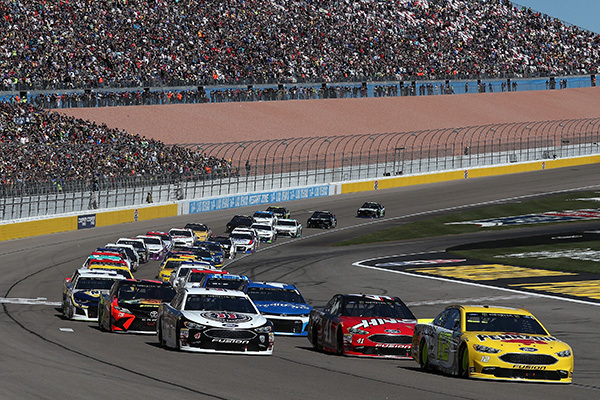 He is only the fourth driver in NASCAR history to accomplish the feat, joining Richard Petty (200 wins), Kyle Busch (184 wins) and David Pearson (106 wins). 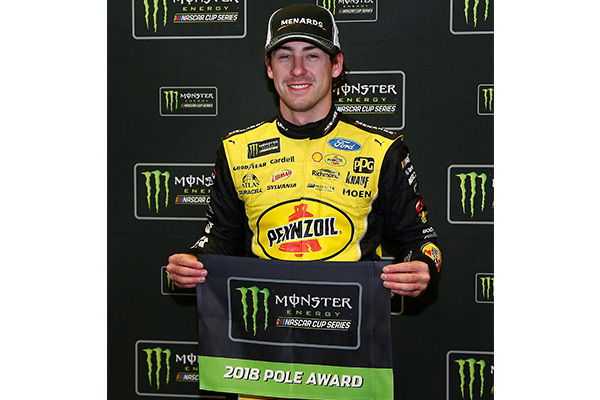 Ryan Blaney recorded his first MENCS pole of the season at Las Vegas and third career MENCS pole. 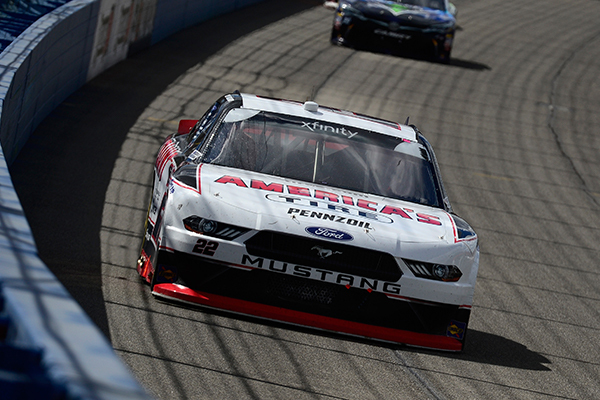 Blaney finished fifth and fellow Team Penske teammates Brad Keselowski and Joey Logano finishing in sixth and seventh respectively, while Wood Brothers Racing driver Paul Menard finished ninth and Stewart-Haas Racing’s Aric Almirola finished tenth. 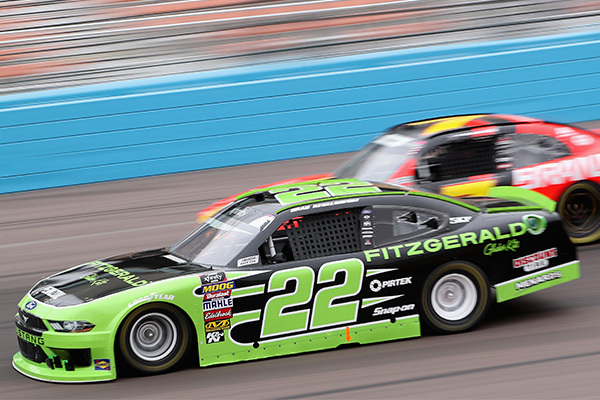 The Fords will travel to the second stop on the west coast swing at ISM Raceway in Phoenix, Arizona this weekend to see if they can make it three in a row. 14 CHAMPIONSHIPS – 318 WINS – 283 POLES! MOORESVILLE, NC – March 6, 2018 – NASCAR announced the 20 finalists for consideration as part of the 2019 Hall of Fame Induction Class . 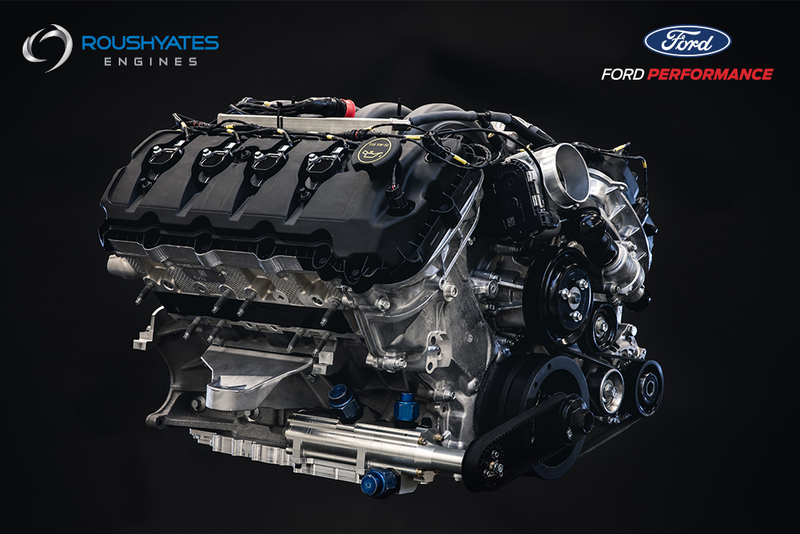 Nine of the men have Ford Motor Company ties, including seven repeat nominees and two newcomers in John Holman and Ralph Moody. Those back on the ballot from last year are current Ford team owners Jack Roush and Roger Penske; 1992 NASCAR Champion Alan Kulwicki; 19-time Ford Cup winner Davey Allison; Buddy Baker, who had 19 wins for a variety of teams including Bud Moore and the Wood Brothers; two-time champion engine-builder for David Pearson in 1968-69 with Holman-Moody, Waddell Wilson; and Ricky Rudd, the sport’s Iron Man, who had 23 wins in more than 900 starts, including stints with Bud Moore, the Wood Brothers and as an owner/driver. Davey Allison made 191 career Monster Energy NASCAR Cup Series starts and all but eight of them were behind the wheel of the No. 28 Texaco Havoline Ford. He ran six full-time seasons when the series consisted of 29 races while running in parts of three others, and wasted little time in grabbing headlines. After car owner Harry Ranier hired him for the 1987 season Allison took off, qualifying second for the Daytona 500 and then grabbing the pole one week later at Rockingham. 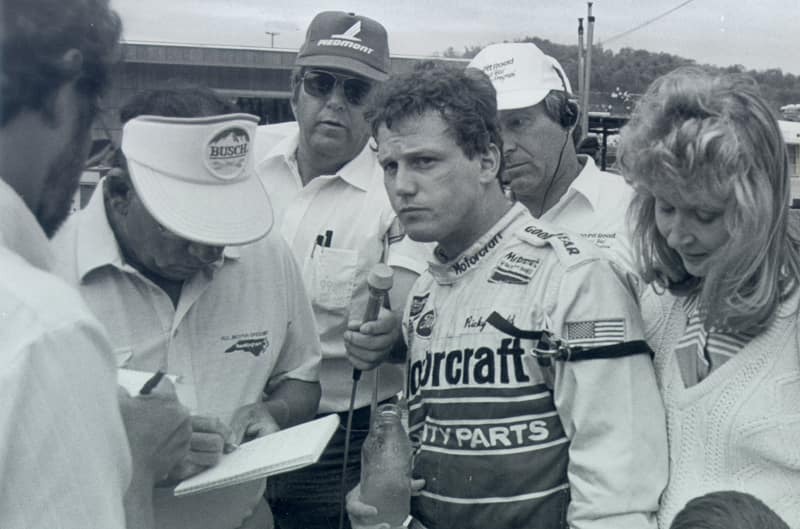 Allison won 19 times overall, four of those with Ranier and the rest under ownership from fellow Hall of Fame Nominee Robert Yates, who purchased the team in 1989. They won the 1992 Daytona 500 together and were in a battle with fellow Ford drivers Bill Elliott and Alan Kulwicki for the season championship, but an accident during the season finale at Atlanta Motor Speedway ended that bid. Davey, the son of NASCAR Hall of Famer Bobby Allison, won his last race on March 7, 1993 at Richmond International Raceway. He died on July 13, 1993 from injuries suffered in a helicopter accident at Talladega Superspeedway. Buddy Baker’s best season in the Monster Energy NASCAR Cup Series came in 1975 when he and NASCAR Hall of Fame Inductee Bud Moore teamed up to win four times, which included a season sweep at Talladega Superspeedway. Baker extended his Talladega win streak to three the following season with Moore, but saw his bid for four in a row end with a second-place run in the fall of 1976. 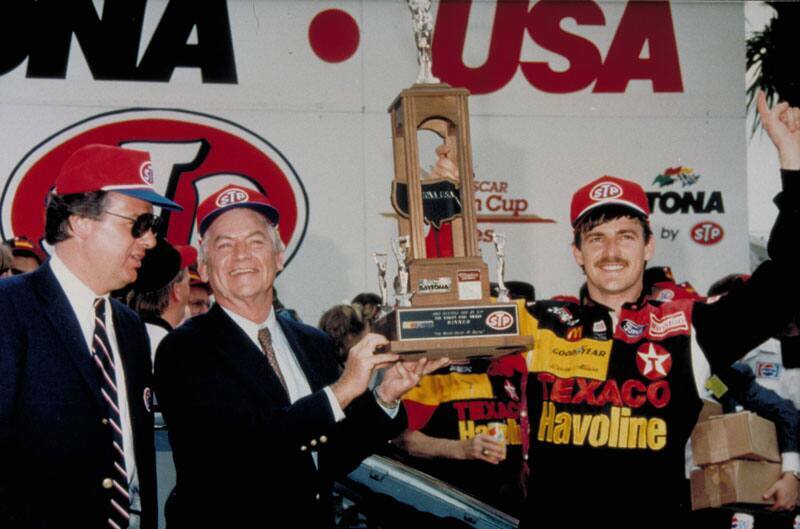 Baker, who won 19 races overall during a 33-year career, made it back to Victory Lane with Ford six years later when he won the Firecracker 400 at Daytona in 1983 with the Wood Brothers. He drove two seasons for the family-owned operation, posting one win, two poles, and 24 top-10 finishes in 42 starts. Alan Kulwicki may have won only five races in his shortened Monster Energy NASCAR Cup Series career, but in winning the 1992 series championship over fellow Ford drivers Bill Elliott and Davey Allison, he established a legacy that continues to shine today. As an owner/driver, Kulwicki changed the thinking of how a race team could be successful as he took a small underdog race team and beat the bigger organizations through hard work and determination. After an accident at Dover with only six races remaining put him 278 points behind, Kulwicki clawed his way back into the title hunt. Entering the season-finale at Atlanta Motor Speedway, Kulwicki found himself second in the standings, but ended up taking the title in his No. 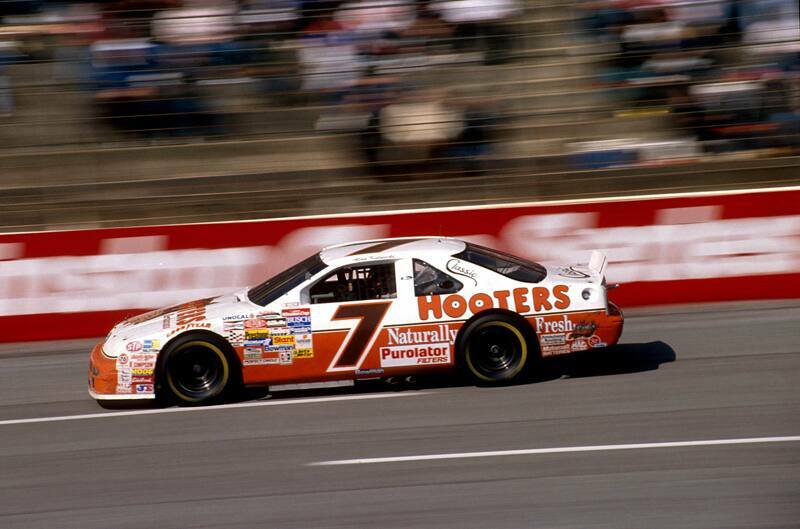 7 Hooters Ford ‘Underbird’ after leading one more lap than Elliott, who ended up winning the race. The fact Kulwicki led the most laps gave him the necessary bonus points to win the championship by 10 over Elliott. Kulwicki, who is one of only seven drivers to win a Cup title with Ford, didn’t have a chance to defend his championship after the plane he was flying in crashed on approach to Tri-Cities Airport on April 1, 1993, killing him and three others on board. 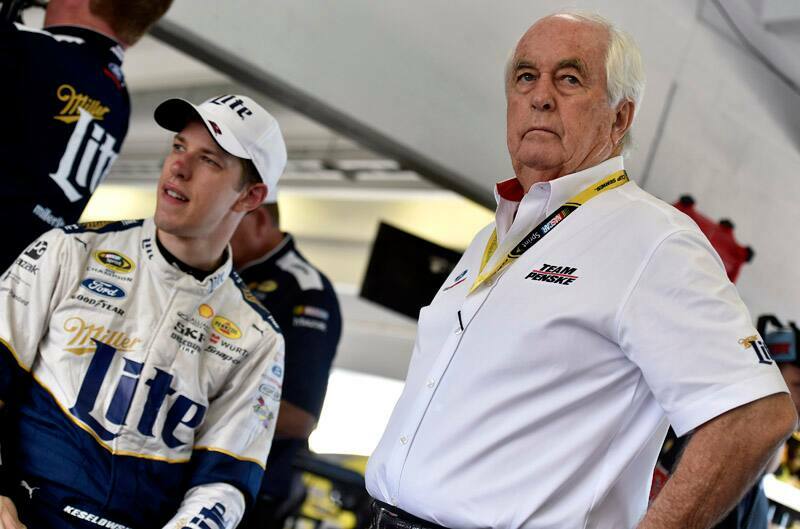 Roger Penske has won 104 Monster Energy NASCAR Cup Series races in his career and 58 of those have been with Ford. 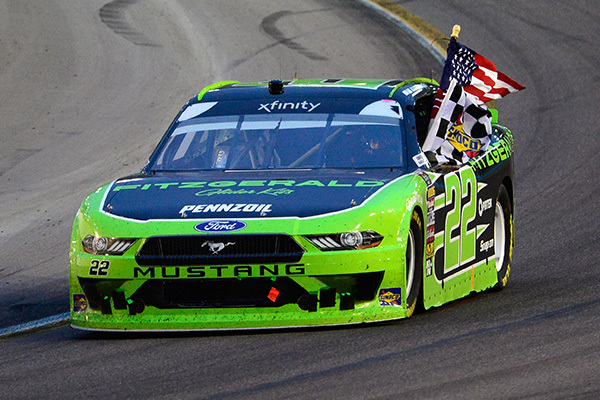 Since returning to Ford at the start of the 2013 season, Penske has put together a three-car operation that has won 31 times on the Cup side, and an equally successfully NASCAR XFINITY program that has 34 wins and four owner’s championships. Penske made an immediate impact with Ford when he first joined the manufacturer in 1994, winning eight times with driver Rusty Wallace. 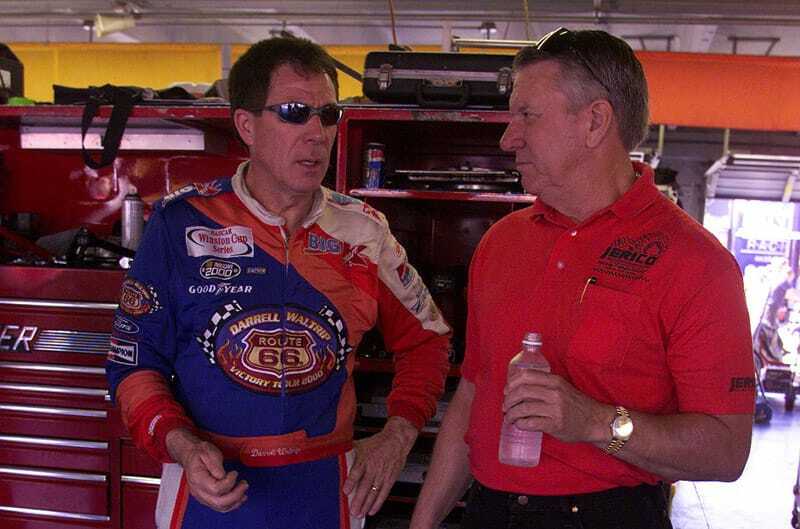 The duo ended up winning 23 races from 1994-2001 and finished in the top-10 of the point standings every season. 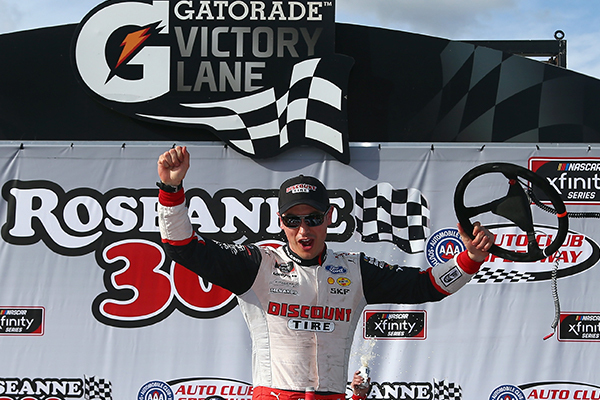 Penske has one Cup championship, winning that with current driver Brad Keselowski in 2012, and has made it to the playoff finals with Joey Logano twice. 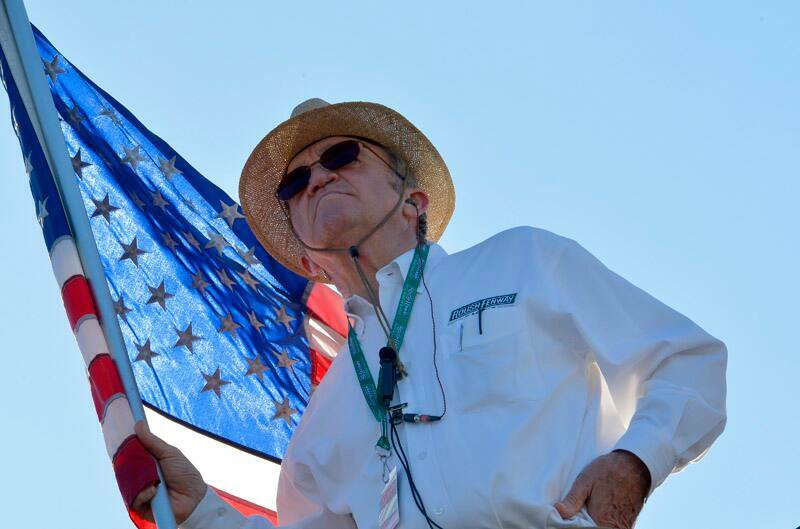 No owner has won more stock car races in NASCAR’s top three touring series than Jack Roush, and he’s done it all with Ford. Since becoming involved in the sport as an owner in 1988, Roush has gone on to post 324 victories in the Monster Energy NASCAR Cup, XFINITY and Camping World Truck Series combined. In addition, he has won at least one championship in each series and eight overall (2 Cup, 5 XFINITY and 1 Truck). He made MENCS history in 1998 by becoming the first owner to expand to five teams, and proved that model could work as evidenced by the fact that each of them qualified for the Chase in 2005. That gave Roush half of the playoff field, which was only 10 at the time. He and NASCAR Hall of Famer Mark Martin are regarded as one of the top owner-driver combinations of all-time, having amassed 82 victories in NASCAR’s top three series together. There may be drivers who have won more races, but when it comes to pure toughness it’s hard to put anyone above Ricky Rudd. Whether it was putting tape over his eyelids after a harrowing crash at Daytona or surviving burns to his backside during a sweltering day at Martinsville, Rudd continually showed what made him a NASCAR staple from 1975-2007. He set the sport’s all-time record for consecutive starts at 788 – starting every race from 1981-2005 – until Jeff Gordon broke it in 2015, and ranks second on NASCAR’s list for career starts with 906. Rudd registered 23 career Monster Energy NASCAR Cup Series victories and went to victory lane 15 times with Ford. His biggest win undoubtedly came in the 1997 Brickyard 400 during a stretch where he filled the dual roles as owner and driver. His success and consistency are also remembered by the fact he had a streak of at least one series triumph for 16 consecutive seasons (1983-98). 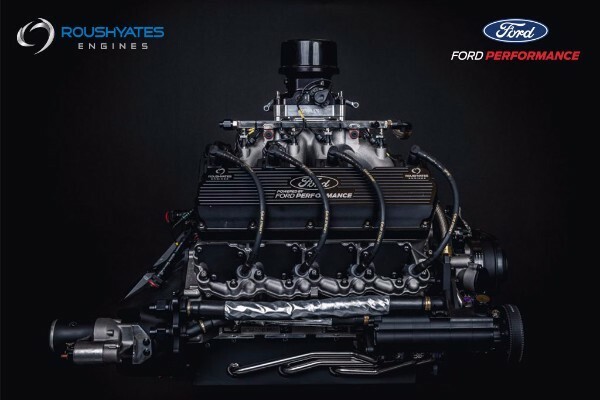 One of the legendary operations in Ford Performance’s NASCAR history is Holman-Moody, and Waddell Wilson had a front row seat as a key contributor with that organization. 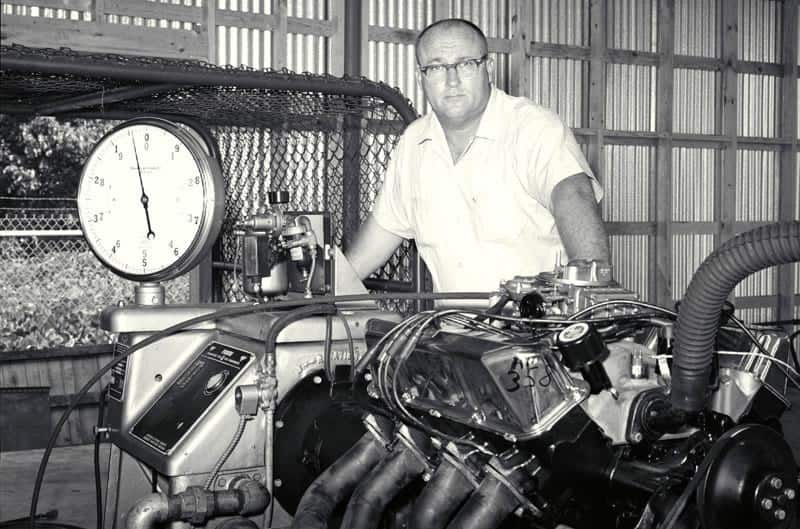 He made his reputation as one of the top engine builders upon joining the team and producing the power that took Fireball Roberts to victory lane in the 1963 Southern 500 at Darlington. As the sixties wound down, his stature grew even more as he was part of the Ford crew that helped Mario Andretti win the 1967 Daytona 500. 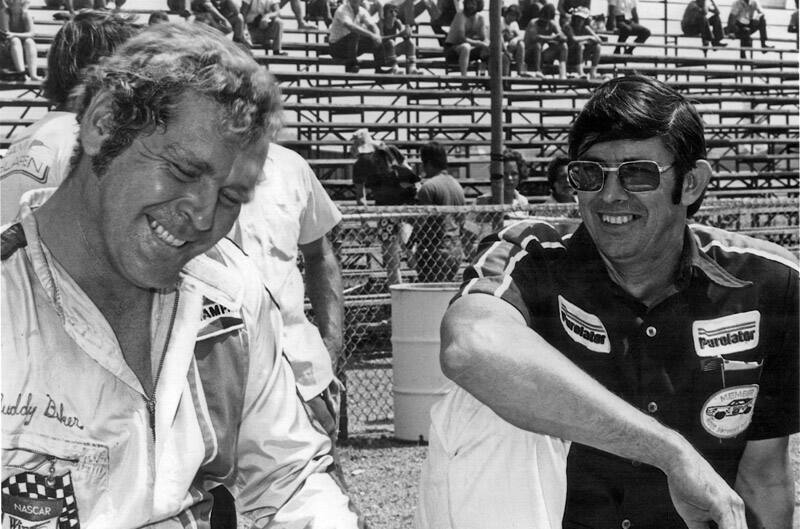 Wilson, who also worked with current NASCAR Hall of Famer Fred Lorenzen during his Holman-Moody days, closed out the decade in grand fashion as he built the power that took David Pearson to consecutive Cup championships in 1968 and 1969. That marked the second and third titles for Ford overall, and the first time the manufacturer captured consecutive crowns. Even though they are on the ballot individually, it seems appropriate to write about them together because they were synonymous with Ford in the 1960s as co-owners of the manufacturer’s main factory-backed organization. It’s the place where NASCAR Hall of Famer Robert Yates got his start and where fellow nominee Waddell Wilson honed his engine-building skills. 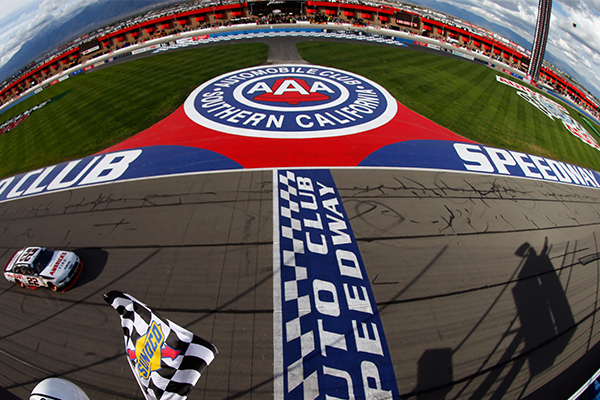 It’s also where legendary drivers like Bobby Allison, Mario Andretti, Jim Clark, A.J. Foyt, Dan Gurney, Junior Johnson, Parnelli Jones, Fred Lorenzen, Benny Parsons, David Pearson, Fireball Roberts, Curtis Turner, Bobby Unser, Joe Weatherly, and Cale Yarborough took turns behind the wheel. 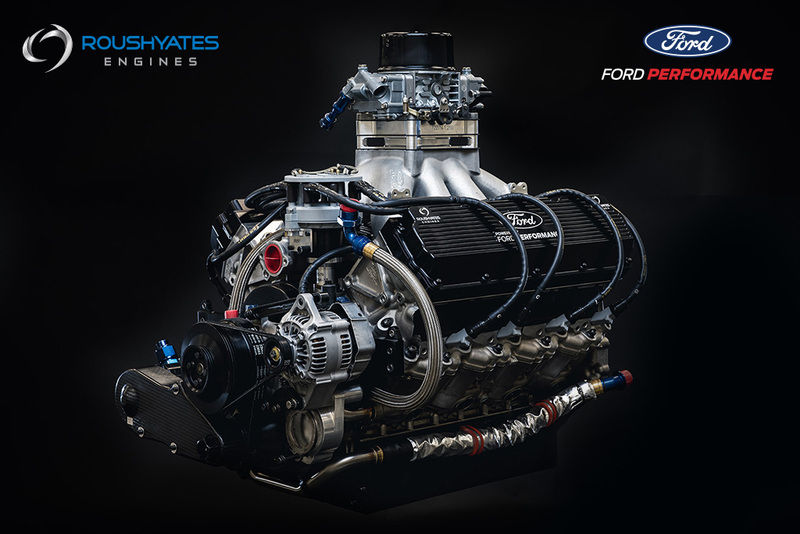 They were responsible for providing the engines that powered the fast Ford of Pearson to consecutive championships in 1968 and 1969 in what is now known as the Monster Energy NASCAR Cup Series. Overall, the organization won 96 races and in 525 all-time starts finished in the top 5 a total of 284 times (54 percent). Voting Day for the 2019 class will be Wednesday, May 23, 2018. 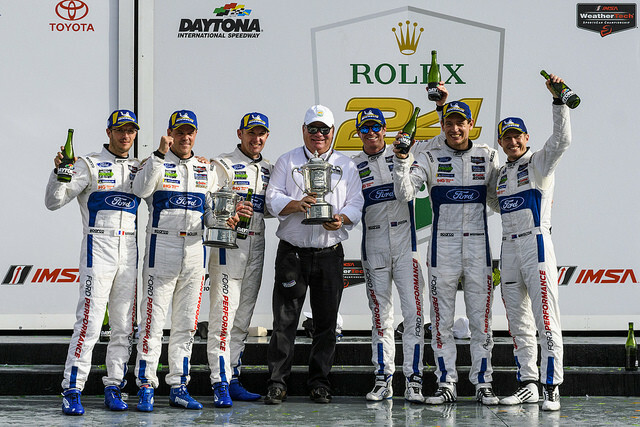 MOORESVILLE, NC, March 12, 2018 – Ford Performance looks to make it two consecutive wins for the Ford GT this weekend. At this year’s Rolex 24 At Daytona, it was their time to shine for the No. 67 Ryan Briscoe, Richard Westbrook and Indy car driver Scott Dixon earning the top spot on the podium, while No. 66 teammates Joey Hand, Dirk Müller and Indy car driver Sébastien Bourdais clinched P2. 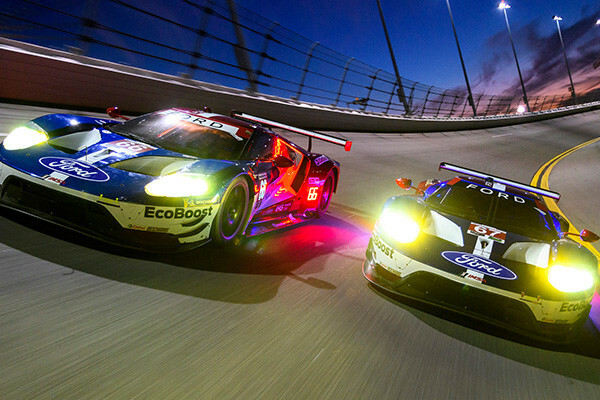 Ford Chip Ganassi Racing will try to keep the momentum going at the 12 Hours of Sebring on Saturday. The Ford GTs used smart pit and tire strategy, not to mention heads-up driving, to get the lead early on in the 24 Hour race and kept it. Will this be the same strategy for the 12-hour race this weekend? 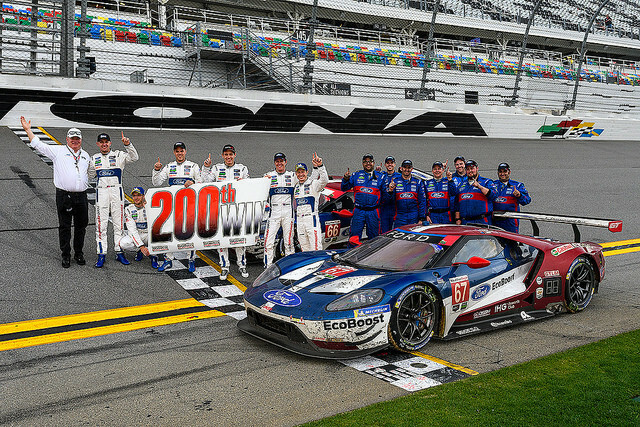 The win in Daytona was the second in a row for the team at the Rolex 24 and the 200th overall for team owner Chip Ganassi. Ford has only one historic race left to win with the new Ford GT – the 12 Hours of Sebring – and that has made the team hungry. At last year’s race in Sebring, Ford nearly finished p2-3 at Sebring after a penalty sidelined one of the leaders, until a last-lap crash put the No. 67 out of podium position. The No. 66 finished second, ending its attempt to win class titles in the Le Mans 24, Rolex 24 At Daytona and 12 Hours of Sebring in nine months. 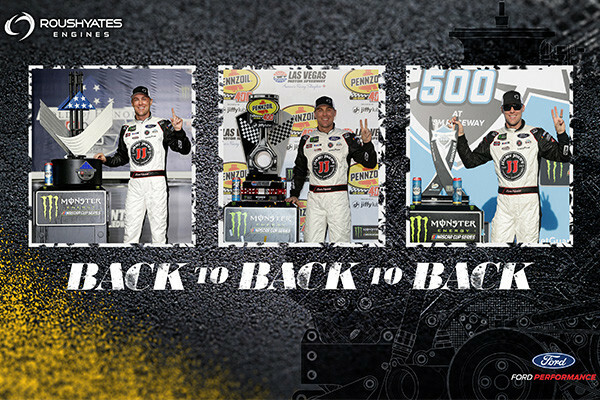 AVONDALE, AZ, March 12, 2018 – Kevin Harvick made Monster Energy NASCAR Cup Series history by winning three Cup races in a row. A feat only accomplished 23 times in the NASCAR Series. No. 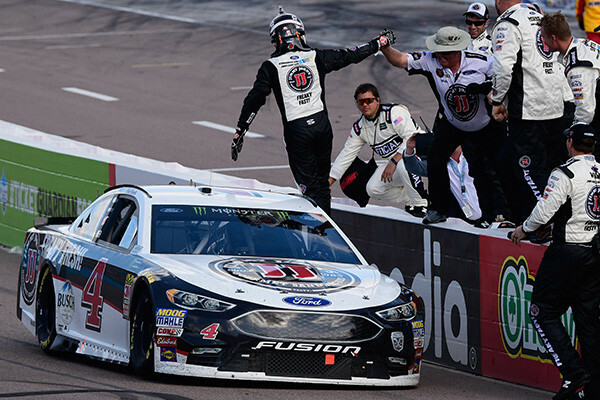 4 Harvick, in his Ford Fusion powered by the Ford FR9 engine, recorded his 40th career MENCS win and fifth win with Ford Performance. 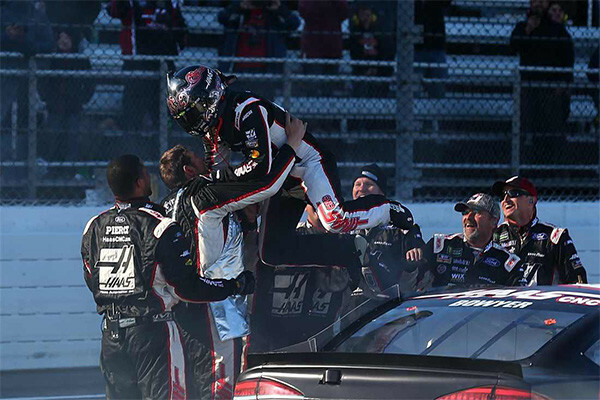 It was a stellar race for Stewart-Haas Racing. All four of the SHR cars finished in the Top-10; Harvick P1, No. 14 Clint Bowyer in P6, No. 10 Aric Almirola in P7 and Stage 2 winner No. 41 Kurt Busch in P10. 14 CHAMPIONSHIPS – 320 WINS – 283 POLES! SEBRING, FL, March 19, 2018 – The No. 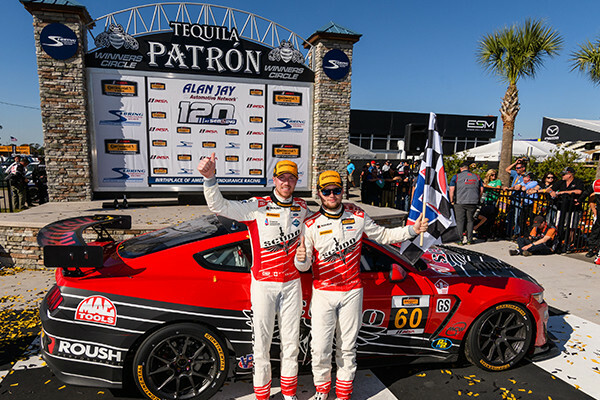 60 KohR Motorsports Ford Mustang GT4 won their second consecutive Continental Tire SportsCar Challenge Grand Sport race title at Sebring International Raceway on Friday in the Alan Jay Automotive Network 120. Drivers Nate Stacy and Kyle Marcelli picked up the teams fourth win and their first as co-drivers in the No. 60. Following in teammates, Scott Maxwell and Jade Buford’s footsteps who won the esteemed race in 2017. This marked Ford’s 45th victory in the Grand Sport (GS) class. 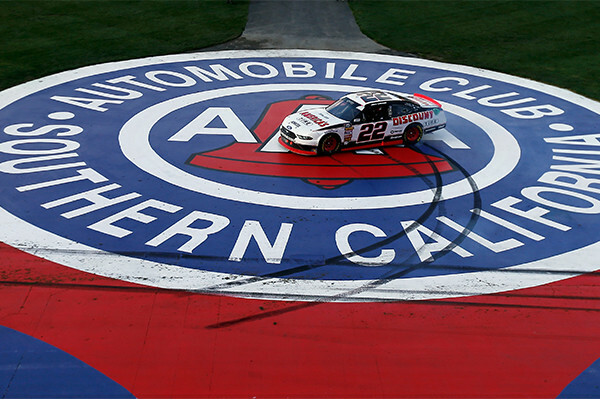 The modified two-hour sprint race allowed for an aggressive strategy call from the pit box, going to a one stop race plan with the 5.2L Mustang V8 engine to complete the 175.78-mile race. As the race unfolded, it would be the one stop call that would allow the No. 60 to inherit the lead and then it came down to managing the Continental tires for the last 20 laps. Six Ford Mustang GT4s started in a field of 37 cars, including KohR Motorsports sister car No. 59 with drivers Jack Roush Jr. and Joey Atterbury. They finished the race P6 followed by AWA Ford Mustang No. 80 in P14. 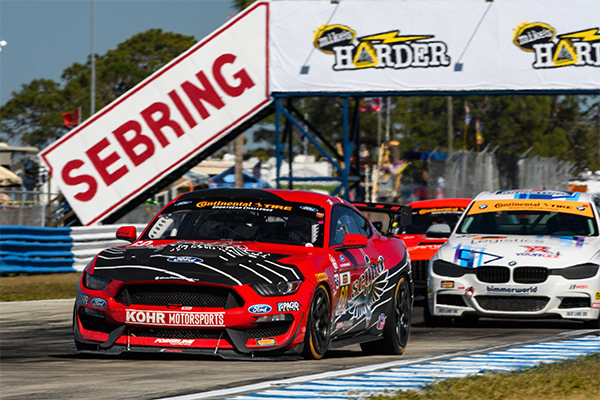 This weekend’s results provides great momentum for the Ford Mustang program as they head to Mid-Ohio for the first time on May 5th. 14 CHAMPIONSHIPS – 322 WINS – 283 POLES! 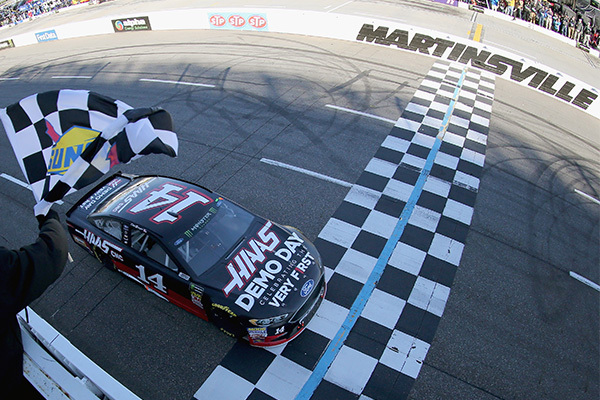 MARTINSVILLE, VA, March 27, 2018 – Clint Bowyer won his first race at Martinsville Speedway, leading a race high 215 laps in the Monster Energy NASCAR Cup Series STP 500. The No. 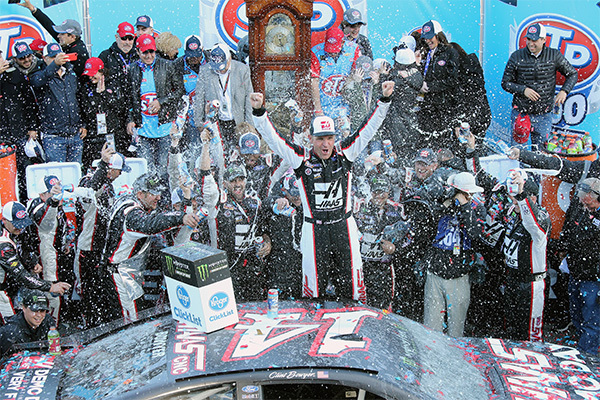 14 Stewart-Haas Racing Ford Fusion powered by the Ford FR9 engine, recorded his first win for Stewart-Haas Racing and a new Grandfather clock. 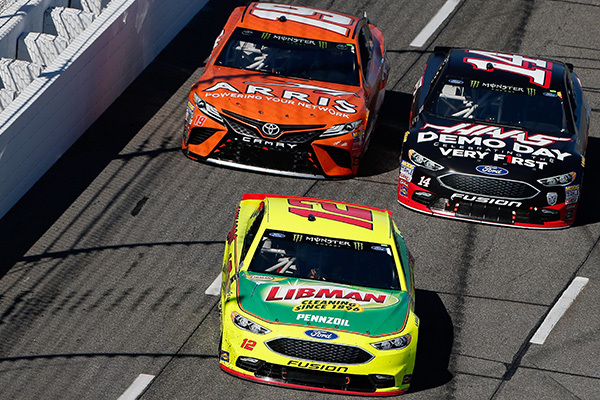 Ford Performance now has 28 career MENCS wins at the famed “Paperclip”. 14 CHAMPIONSHIPS – 323 WINS – 283 POLES!